Durch die Kombination aller verfügbaren Informationen in einem geographischen Informationssystem konnten räumliche und statistische Analysen vorgenommen werden, die auch mit den bisher bekannten Anlagen aus dem gesamten Verbreitungsraum verglichen werden. Die Datengrundlage bietet auch die Möglichkeit der virtuellen Rekonstruktion der Kreisgrabenanlagen und ermöglicht eine Untersuchung der astronomischen Aspekte der aufwendig errichteten Bauwerke. Das Ergebnis zeigt die Vielfalt der Ausformungen der Monumente und ihre Gemeinsamkeiten, die von den Siedlern der Mährisch-Ostösterreichischen Gruppe der Lengyel-Kultur in Österreich in einem kurzen Zeitraum errichtet und genutzt wurden und bringt neue Hinweise zur Deutung der Funktion der ersten Monumentalbauten Mitteleuropas. In the middle Neolithic period (4850/4800–4600/4550 BC), all over Central Europe beyond the cultural boundaries, archeology has shown that monumental buildings were erected. These so called circular ditch constructions consisted of up to four circular, deep ditches creating an interior space fenced off by palisade walls. 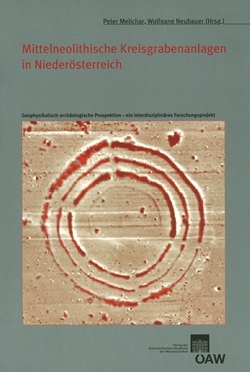 In 2003–2004 the central area of distribution in Lower Austria was examined by systematic geophysical – archaeological prospection. Based on the standardised plans now, for the first time a detailed examination of the Austrian circular ditch construction is possible. By combining all available information in a geographic information system, special and statistical analysis can be carried out and compared with known constructions in the complete distribtution area. The database also offers the opportunity for virtual reconstruction of the circular ditch constructions and faciltiatesexamination of the astronomic aspects of the lavishly constructed buildings which were erected and used by the settlers of the Moravian-East Austrian Group of the Lengyelculture in Austria within a short period. The result shows the various forms of the monuments and their common features, and leads to new evidence on the interpretation of the function of the first monumental buildings in Central Europe.